Last month, Head Coach David Quinn told The Daily Free Press that he planned to make cuts to the Terrier roster. This week, both the Boston Hockey Blog and SB Nation reported that the players involved are freshman forward Brendan Collier and sophomore transfer JD Carrabino. SB Nation indicated that both players are seeking to transfer to other schools. It did not take long for Robbie Baillargeon to establish himself as a top-line player for Boston University. He exceled on a checking line to kick off the 2013-14 campaign, and Terriers head coach promptly promoted the rookie to the first line. Baillargeon works hard to win puck battles, retain possession and create offense. He can thread passes and shoot well, and given increased playing time, Baillargeon soared to become the Terrier’s leading point-scorer this season. With 10 goals and 17 helpers through 35 games, he was named to the Hockey East All-Rookie Team. As Baillargeon builds strength and bulks up his 6’0, 175 pound frame, with his current skill set intact, the ceiling for Baillargeon appears high. 2014 recruit Jack Eichel was named a second team USHL All-Star. 2014 recruit Liam Coughlin and the Vernon Vipers have reached the semifinals of the RBC Cup, Canada’s Junior A championship tournament. On Saturday they’ll take on the Yorkton Terriers, whom they defeated, 6-4, in the preliminary round with Coughlin (G,A) earning player of the game honors for the Vipers. Coughlin, a 6-3 left wing from South Boston, scored 45 points during the regular season, tied for third best on the Vipers, and added 13 more in 19 BCHL playoff games. The last former Terrier actively involved in the pursuit of the Stanley Cup--Nick Bonino-- was eliminated last night as the Kings ousted the Ducks with a 6-2 win in game seven of the Western Conference semifinals. 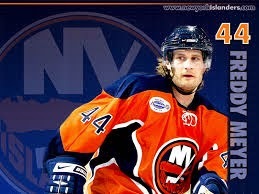 The former BU captain assisted on one of the Anaheim goals, giving him a 4-4-8 scoring line in 13 playoff games. His regular season totals for goals (22) and assists (27) are both career highs. Technically, one other ex-Terrier is still involved in the playoffs. Adam Clendening was called up to the Blackhawks but has yet to dress for any games. 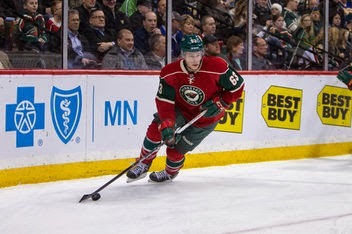 Charlie Coyle, whose playoff season ended when Chicago eliminated Minnesota in six games, reportedly played the series with two separated shoulders. 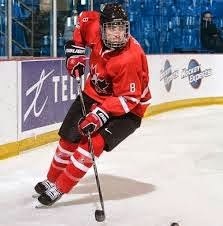 Coyle scored 3 goals and 4 assists in 13 playoff games. Former BU All-American Freddy Meyer has been named head coach of the new EHL franchise, the East Coast Wizards. Meyer, who spent the past two seasons as assistant coach of the AHL Manchester Monarchs, scored 73 points in 281 NHL games after a four-year career at BU and two seasons in USA Hockey's NTDP program. Former Terrier blueliner Jakabs Redlihs is competing for Latvia in the IIHF World Championships in Minsk, Russia. 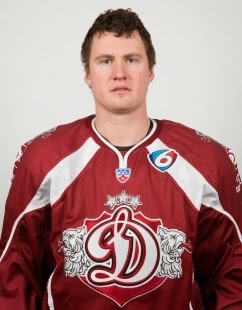 The 6-2 defenseman, who currently plays for Dyanmo Riga in the KHL, was a fourth round draft pick of the Columbus Blue Jackets in 2002. Redlihs recorded an assist in Latvia’s 6-5 win against Team USA on Thursday. The Boston Herald reports that former Terrier forward and associate head coach Mike Bavis is a candidate for the vacant Holy Cross head coaching job.